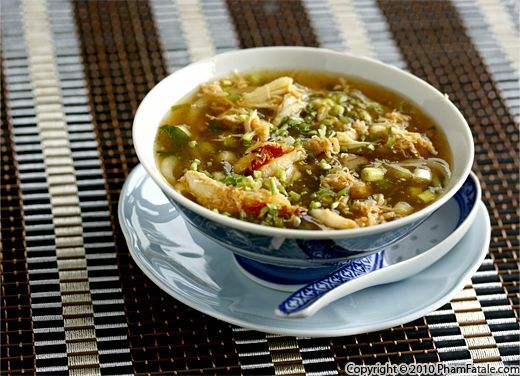 Vietnamese Crab Soup (Súp măng tây nấu cua) was always a festive dish when I was a child. We would have it whenever my parents had non-Vietnamese friends to our house for dinner. I would help with cracking the crab and gathering the crab meat. Corn starch, used as a thickening agent, gives the velvety, thick broth gives the dish a unique texture. While white asparagus doesn't provide a lot of color contrast to the crab, it does complement the flavor quite well. Clean the crab, brush and rinse thoroughly. Place in a pot, add about ½ to 1 cup of water and bring to a boil for about 10 minutes (see tips). Transfer to an ice water bath for about 3 minutes to stop the cooking process. Drain and discard all the liquid. Remove and discard the abdominal flaps (the triangle-shaped tail). Lift and separate the back-fin with the rest of the claws by placing a large tablespoon at the bottom of the crab. Remove and discard the "lungs" (also known as Devil's fingers; they have a spongy texture and are inedible. Gently remove the crab meat from the back-fins (the inner chambers are filled with meat). Gently crack the claws using a meat tenderizer mallet and gather all the crab meat in a large mixing bowl. Trim about ½ inch from the root. Using a vegetable peeler, shave a few inches from the root; this part is fibrous. Cut the asparagus into 2-inch pieces. Blanch the asparagus for 4 minutes in boiling water, then transfer into an ice bath. (Dip the heads of the asparagus for 2 minutes only). Drain thoroughly, then pat dry on a paper towel. Do not over-cook as the asparagus will continue to cook in the chicken broth later; it should still be tender and crisp and not mushy or you will have depleted all the healthy nutrients. In a saucepan, heat the oil. Add the shallot and cook until slightly golden. Add the asparagus, crab and enoki mushrooms. Add red chili flakes and mushroom seasoning salt. Sauté for about 2 minutes until fragrant. Set aside. In a small bowl, dissolve the corn starch into 3/4 cup of water. In a large pot, bring the chicken broth to a full boil. Adjust seasoning. Mix the corn starch liquid one more time and add it to the boiling broth to prevent the starch from sticking to the bottom of the pot. Continuously stir the broth as it will thicken very quickly. Add the mushrooms, asparagus and crab. Add the green onions and 2 tablespoons of cilantro. Check the texture of the sauce; it should be thick and syrupy. If you find the sauce to be too thick, add more water. Cook for about 2 minutes. Stir gently. Optional: Crack 2 eggs in a small bowl. Gently break the egg yolks using a fork. When you're ready to serve, bring the soup to a boil one more time. Add the lightly beaten eggs while stirring the thickened soup. The heat from the soup will slightly cook the eggs and will create yellow and white threads. Sprinkle with black pepper and cilantro. Add bean sprouts (if used) for crunch. 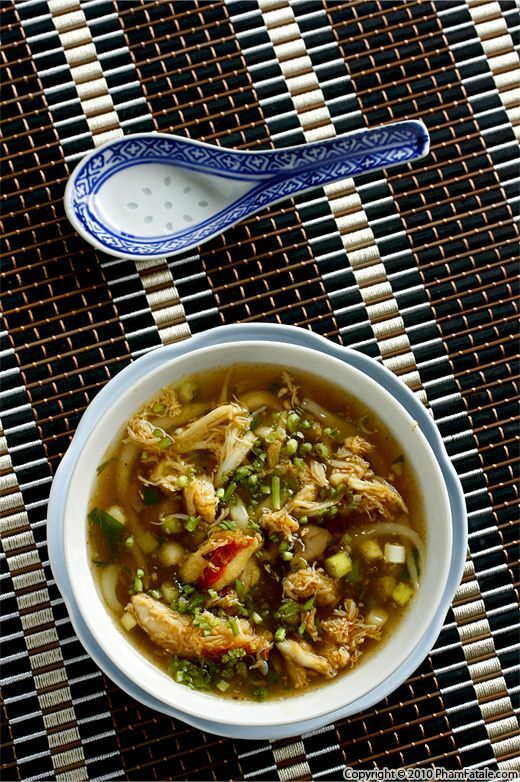 Drizzle some nước mắm into the broth to finish. For the crab cooking time, count approximately 8 minutes per pound. Mushroom seasoning salt brings a very distinct, earthy flavor to the sauce. You can find it at gourmet specialty stores or in most Korean stores. I buy it at Marina Foods -10122 Bandley Drive -Cupertino, CA 95014. I love bean sprouts; they add some crunchiness to the dish. Maman's version never has bean sprouts and always contains boiled quail eggs and canned baby corn in addition to the ingredients listed above. White asparagus don't turn green because they're grown under the soil so they don't get sun exposure. They have a more velvety texture and nutty flavor than green ones. Măng tây = asparagus, literally "French bamboo"